The next meeting (April 9, 2011) of the National Capital Area Chapter of The Gesneriad Society will be on photographing gesneriads, and one part of the session will be dedicated to how photographs are judged in a Gesneriad Society Show. What better way to learn than to have your photographs judged? General Guidelines: The photograph must be no larger than 8” x 10” and the final presentation must be no more than 12” x 14” (if matted and framed). An easel must be provided to hold the photograph up for viewing. For more information, refer to the Schedule for The Gesneriad Society's Convention. Entries in a Show are anonymous, so the photographs judged at the April meeting will also be anonymous. So... no reason not to bring one in, right? As for the other parts of the April program, there will be general discussion, Q&A, and some hands-on time, so bring a plant to shoot and/or your camera too. P.S. It is aquarium donation day too. P.P.S. I suppose there should be a photograph to go with this post.... Would this qualify as a part of a plant? 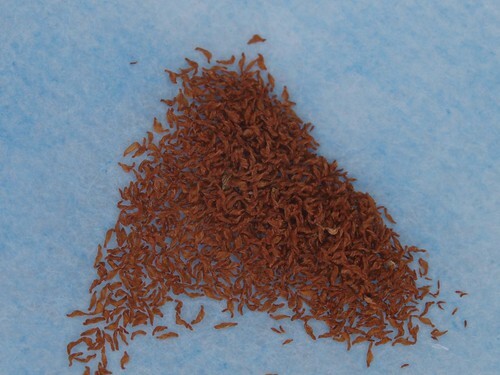 The seeds of Sinningia ('Tampa Bay Beauty' x self), which likes growing outdoors in the summer, and some of which have nice open red flowers, while others have somewhat closed red flowers.